Coastal regions around the world have become increasingly crowded, intensively developed, and severely exploited. Hundreds of millions of people living in these low-lying areas are subject to short-term coastal hazards such as cyclones, hurricanes, and destruction due to El Niño, and are also exposed to the long-term threat of global sea-level rise. These massive concentrations of people expose often-fragile coastal environments to the runoff and pollution from municipal, industrial, and agricultural sources as well as the impacts of resource exploitation and a wide range of other human impacts. Can environmental impacts be reduced or mitigated and can coastal regions adapt to natural hazards? 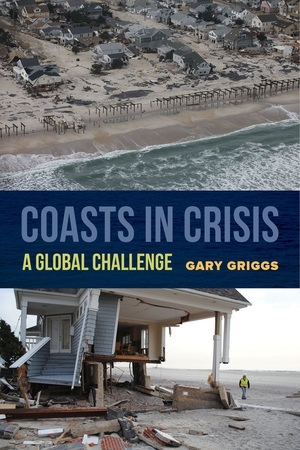 Coasts in Crisis is a comprehensive assessment of the impacts that the human population is having on the coastal zone globally and the diverse ways in which coastal hazards impact human settlement and development. Gary Griggs provides a concise overview of the individual hazards, risks, and issues threatening the coastal zone. Gary Griggs is Distinguished Professor of Earth Sciences at the University of California, Santa Cruz. He is author or coauthor of Introduction to California’s Beaches and Coast, Living with the Changing California Coast, California Coast from the Air, The Santa Cruz Coast (Then and Now), and Our Ocean Backyard.